The Jobst FarrowWrap short-stretch compression system is the new alternative from the BSN Medical product range especially beneficial for those patients with fluctuating oedema, rebound oedema, donning and doffing problems or for patients who have limited access to professional bandaging. 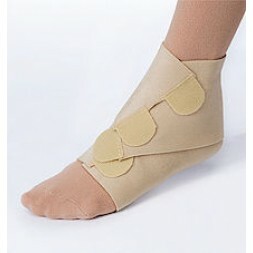 The overlapping bands provide support and rigidity to control oedema. The easy to use wrap system offers independence and the ability to manage oedema as it can be easily removed and reapplied. Jobst FarrowWrap is a wrap compression system that consists of a liner and an outwrap piece, available for the upper and lower limb. It is available in three material types/compression levels. A double-laminated fabric suitable for mild to moderate oedema. Conforms to limb shape. A good choice for patients who have neuropathy or peripheral vascular disease. The fabric is breathable and soft and is ideal for sensitive skin, palliative care and paediatric patients. Machine washable and can be tumble dried on low heat. Rigid fabric with a comfortable feel. 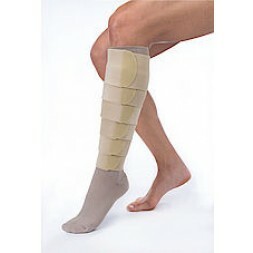 Suitable for moderate to severe oedema with an irregular limb shape. Fabric lays flat against skin folds making it less likely to roll down. Durable fabric, reinforced spine. Hand wash only and lay flat to dry. Very soft inner layer which is less rigid than CLASSIC. Suitable for moderate to severe oedema. Suitable for minor skin folds and some limb shape distortion. Material less likely to pill or fray. Contoured bands that conform to the limb to resist sliding. Highly breathable, comfortable, durable and cost effective. Machine washable and can be timble dried on a low heat.